Pantone has announced “Radiant Orchid” is the color of the year for 2014, succeeding 2013′s color Emerald. Leatrice Eiseman, executive director of the Pantone Color Institute, said in a statement that the color of 2014 is “an invitation to innovation” that “encourages expanded creativity and originality.” She also claims it’s a color that Michelle Obama often wears and notes designers like Max Mara, Marc Jacobs, Salvatore Ferragamo, Ermengildo Zegnahave have been incorporating orchid hues into their collections in the past year, the AP reports. Pantone officials picked “radiant orchid” based on extensive interviews with industrial and fashion designers worldwide about what color they plan to use in upcoming seasons as well as sales of “color swatches,” according to the Wall Street Journal. We expect this colour to find its way into our wardrobe and our home in the coming year. 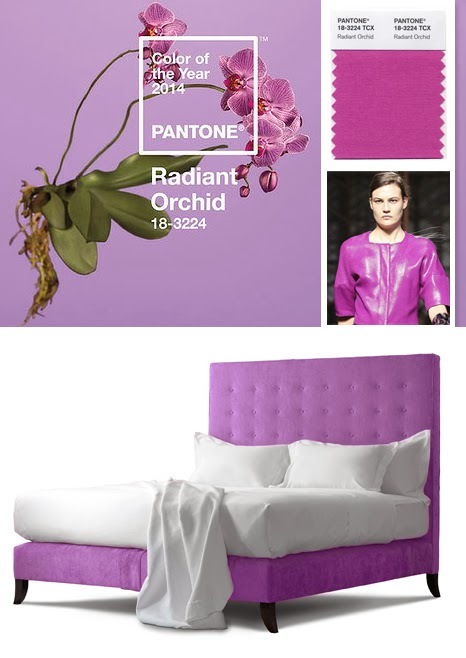 At Savoir Beds we have already come up with this beautiful option to bring 'Radiant Orchid" into the bedroom. If a headboard and base is too much for you maybe some luxurious linens with a subtle orchid cording will do the trick? Whether it's painting a whole room or just a few scatter cushions start thinking how you can bring this vibrant colour into your home next year. What a decent color combination your bed have..